Last February I saw a note in the paper, something to the effect of "Remembering Harry Carey 10 Years Later". Had it really been 10 years? I'm not a baseball fan, but I remember where I was when I heard he died. I live in the Chicago area, the second coming of Christ wouldn't have received as much attention. I can picture a younger version of myself huddled in a room lit only by the glow of CRT monitors. The idea of a cheap mp3 player, or one over 64mb for that matter, was laughable so my headphones were piping-in AM radio. I was less than a month into my first programming job, eager to launch my fledgling career. Mercator Software, TSI International Software at the time, was my entry to the professional information technology (IT) world. It couldn't have come at a more interesting time, the peak of the dot-com bubble. We weren't a dot-com company, we were in business years before the Internet, but we were swept away by the madness. In a flash it was a billion-dollar company, only to sink in equally spectacular fashion. And there's me in 1998, last one in the office that unseasonably warm night, about to witness it all. Semi-Disclaimer: My experience at Mercator is not comparable to the majority of employees who worked there over the years. I worked at the Bannockburn Illinois office which supported their line of EDI/B2B software. The home office was off in Wilton Connecticut and the flagship Mercator product line was developed down in Florida. Legalish Note: The Mercator Software referenced in this article is of no relation to the current owners of the mercator.com domain, ditto for TSI International Software and tsisoft.com. Most, maybe all, of the copyrights, patents, and assets formerly owned by TSI International Software/Mercator are presently owned by either IBM or emanio. After five years of working retail I decided I had my fill. I only had a year of college complete but knew I could find a programming job anyway. In the late 90s if you could spell "HTML" you were hired. I didn't want to quit going to school though. I knew I'd need the degree for whenever the madness died down. So I went to the head of the Computer Science department to see if he knew anyone looking for students part-time. Sure enough, he had two former students looking for any help they could get.. well, any help that would work for less than the ridiculous amounts programmers were commanding at the time. I called both of them and had interviews within a week. The first place was a plant that printed junk mail. They were looking for C programmers for embedded systems. It wasn't exactly what I wanted to do but would have taken it if not for the visit to TSI Software.. I interviewed there in late December 1997 between the two retail jobs I was working. The interviewer was the manager of the development department who would be my boss. He was young and energetic which made the company seem more appealing. They were primarily looking for students to work on creating custom reports for clients. I mentioned that I knew Visual Basic and he said I'd be able to move into "real" development after a couple months. That last part made me skeptical but I trusted him, can't say why other than he didn't seem the type that would lie just to sucker someone to work for him. The work environment at TSI was not what I expected. I assumed offices were all stuffy and uptight but this was nearly the opposite. Jeans were perfectly acceptable attire so long as you weren't meeting with a customer. The dress code did call for a business casual shirt but I noticed right away that developers seemed to be exempt. In all likelihood that was due to us being isolated from the rest the office. We had our own separate corner of the building, we had to walk through the tiny manufacturing and shipping area to get there. Off in our little corner we rarely turned the lights on, happily working away in the dark. After about a year I decided to put up Christmas lights to add a little ambiance. Another perk was free coffee. I don't get why this isn't an office standard. A couple bucks a day results in a massive productivity boost. It was essential for someone on my schedule. I shouldn't complain, now that I wasn't working retail I finally had weekends off. This meant longer weekdays but it was a much desired improvement. There was one other developer there who also attended college full-time and carried a similar schedule, management was cool with it as long as the work got done. My desk sported two PCs, a Windows NT 4.0 development PC and a Windows 98 test PC. We had to be able to test on any platform we supported so every developer's desk had a minimum of two PCs. Virtual PC would have saved us a ton in hardware costs had it existed. The Windows 98 PC eventually became an over-powered radio once I discovered Winamp and Shoutcast, back at home with dial-up I never would have explored the world of not-yet-unregulated Internet radio. The early days were pretty much what was described in the interview.. creating reports, an endless number it seemed. The largest program we supported was Trading Partner PC. It was, well I guess still is, an Electronic Data Interchange (EDI) system. It was used for companies to send/receive purchase orders and invoices. There are volumes of standardized documents and such associated with it. It's one of those boring old technologies that just never goes away. With some training, you could configure Trading Partner PC to work with whichever supplier/buyer you wanted. Most customers opted to purchase a pre-built kit though. A kit was essentially an add-on that had everything you needed to work with a supplier/buyer. For example, we had kits to order parts from Ford and sell products to Home Depot. Each of these kits needed to have its custom reports defined. We had a proprietary reporting language that I learned in a couple hours. It was painfully dull work, if the company was still in business this would no doubt have been offshored by now. Luckily I could slap on some headphones and the time went by quickly. When Visual Studio 6.0 was released I rushed to install it on my NT machine. I didn't need it for the work I was doing but man was I eager to play around with it. Over the years I've lost a bit of that enthusiasm, installing a new IDE seems like a chore now. I think that's because IDEs got about as good as they're going to get a few years ago. Visual Studio 6.0 paved the way for that. It was such an improvement over the prior versions that I felt underwhelmed when I first saw Visual Studio .NET. Even the freshest version of Eclipse falls short of trusty ol' Visual Studio 6.0 in many ways. If Microsoft wants to conquer the open-source development market all they need to do is release the ten-year old version of their toolset and it'll crush the current free offerings. Thankfully, some "real" development started to trickle in soon. After months of mindlessly creating reports my boss started handing me some Visual Basic 6 (VB6) tasks. It was just part-time until I caught a lucky break when someone from the support area was "promoted" to the development team to work on reports. I put "promoted" in quotes because it was heavily frowned upon to call it a "promotion" when someone moved from support or quality control to development even though everyone regarded it as such. In my time at TSI/Mercator I saw several such "promotions", some great, some not great. This freed me up to where I could work full-time on VB6 development. It was even for a new product, not the typical maintenance grunt work that's always assigned to the lowest guy on the totem pole. Fall 1998: Do not look behind the curtain! Little did I know the project I was working on was DailyWTF material. It was a pet project my boss and a senior programmer had been semi-secretly working on. The best description I can come up with is it was an application to process EDI over the Internet. OK, transporting EDI transactions over HTTP isn't rocket science. This was more around being able to create web-based forms and reports from EDI documents. They built a skeleton UI that was flashy enough to secure formal approval of the project from the higher-ups they demoed it to. The problem with showing-off a functional UI early is that it gives the false impression that the application is nearly complete. To an untrained observer, they see stuff happen when buttons are pressed ergo the program is 99% done. That was the issue with this project from day one. The skeleton UI was just that, nothing was implemented other than hard-coded dummy results. To make matters worse, the UI was now the de facto requirements document for the project. Changing it was not an option since that's what everyone expected to be delivered. I was given the assignment of completing the web form generator. You'd select an EDI document, like a purchase order, select the fields you want, and presto... a data-entry web page would pop out. Not only that, but it was going to use this fancy new ActiveX technology. Instead of standard form input boxes it was supposed to generate ActiveX controls that used MDAC 1.5 (later 2.0) to save what the user entered. I suppose a simple form with simple input boxes that posted to a simple CGI script would have been, well, simpler. This application needed to work for users who ran it on a desktop though Why would you create web forms for use on the desktop? Beats me, I didn't design the application. I was the poor chump who toiled hours trying to actually make it work. This crazy web form generator application needed to support all the standard X12 documents. There were validation rules, maximum lengths, code lookups, conditionally mandatory fields, and repeating elements to deal with. It wasn't just throwing a few input boxes on a page, it was complete mess... which also describes what the generated pages looked like. I wasn't on the project long before my boss quit to start a consulting company. On his way out he left many assurances with the VP he reported up to that the project was nearly complete. A very short time later the senior programmer also left due to a private matter. Suddenly I was solely responsible for delivering this visionary application. Today I could have done it, not sure that I'd actually want to but rest assured it would get done. In 1998 I wasn't quite skilled enough to pull off the massive duct taping that needed to occur. The web page generator was ~75% done.. buggy, ugly, but it worked for the 10-20 most common EDI documents. Unfortunately that meant about 300 more had to be tested, and debugged, and retested, and so on. The rest of the application was in the same or worse condition. If you stuck to the basics it mostly worked. If you tried anything outside of that comfort zone all kinds of spectacular errors would occur. I tried to think of a way to communicate up through management that the project was in bad shape but couldn't come up with anything. "Luckily" I didn't have to, the aforementioned VP wanted a demo of this "nearly complete" software. That morning seemed to last forever. Waiting at my desk for the demo time to arrive, thinking that as long as he doesn't touch the keyboard everything would be OK. That's it! I'll just drive the demo and make sure not to click on anything risky. He's just some suit right? He'll see the pretty pictures and be happy, problem solved. Well, this particular VP didn't get to where he was by just getting a drive-thru MBA and wearing a pressed shirt every day. He understood what the product was supposed to do and wanted to try it out for himself. It was under a minute before the first bug appeared followed by a stream of countless others. I tried to explain away the first few but that didn't hold up for long. Finally, I broke down and admitted the program was smoke and mirrors. I explained it was months, maybe a year, from being a useful product. I assumed I'd be fired on the spot, I was mentally prepared for it. Yeah, that line of thinking didn't really make sense. In hindsight I just inherited the mess and delivered the bad news, at the time I somehow felt responsible for it though. He was clearly unhappy but not surprised. He politely dismissed me and that was that. To this day I feel a great amount of respect for how he handled the situation. It would have been easy to blow up at the new guy and send him packing. Now in a management role myself I don't know how I would handle it, I hope I never have to find out. The project was shelved and I was given the typical maintenance grunt work that's always assigned to the lowest guy on the totem pole. This was quite good for me though, I was able to hone my development skills at a more reasonable pace. Most of my work focused on the VB6 components in Trading Partner PC. The application was primarily written in Visual C++ but some VB6 UIs were added when something needed to be created in a hurry. Like everything created in a hurry there was an assortment of odd problems to fix. Every now and then I'd fix a few bugs in the C++ code but they were usually handled by one of the more senior developers. Over a 10+ year software development career I've had many other projects scrapped. Some in the early stages, some after running blissfully error-free for years. Although disheartening the first few times, I now find more cause for celebration in retiring an application than launching a new one. There's a feeling of closure that's downright calming. No more worries that a ticking time bomb bug is waiting to explode. No more emails asking if it works on an OS that was invented years later. No more support questions with long forgotten answers. Nothing but the quiet serenity of a delete key being pressed on a distant keyboard. TSI had small sales offices in a couple foreign countries but the their international presence ballooned in 1999 when they acquired a company called Braid Group LTD for $95.2 million. We now had a full-fledged office in London. It was a sign that TSI was evolving into something larger than the little niche software company it was for most of its existence. Another sign of growth was the announcement of a new VP every couple of weeks. It seemed like they were close to outnumbering the rest of the staff. Over in our dimly lit corner of the building we frequently assigned ourselves VP titles. Although my first name is rare in the United States, it's slightly less uncommon in the United Kingdom, slightly. Thanks to good ol' Outlook auto-complete I would sporadically receive dirty jokes and pictures intended for someone's office chum in London. Things were moving along well for me now. Most of my time was spent adding reporting enhancements to Trading Partner PC. Boring stuff like audit reports for EDI transactions, I'll spare the details. TSI as a whole was enjoying the tech bull market of the time. The stock went up every day; good news about big contracts and more minor acquisitions flowed freely. The office was constantly upbeat, even though we weren't a dot-com company we shared in the energy of the era. Our company was booming and there seemed to be no end to the blue skies ahead. I should probably talk about technology somewhere in this mess. That summer we received beta versions of Windows 2000. After only one test drive I rushed to replace my Windows NT workstation with it. Windows 2000 was a huge leap forward for the operating system. I'd argue the last positive advance it's had. Windows 2000 was the perfect marriage of the NT and 9x line. Like Visual Studio, if Microsoft decided to open the source for Windows 2000 it would flatten all competitors. The compatibility for Windows 2000 was perfect, I don't recall having to fix a single bug for it. Around this time I started working on something significant again. 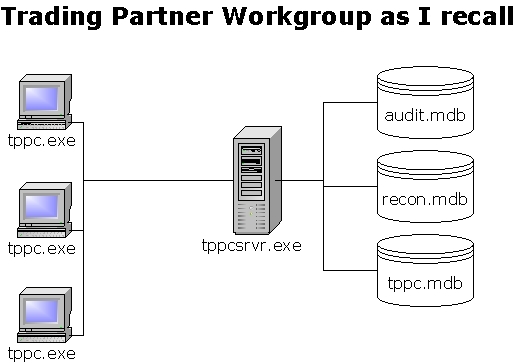 We started a project to convert our Trading Partner PC application to work in a client/server model. It was always a single-user program but we received many requests to allow multiple users to work with the same data. Instead of Trading Partner PC we were dubbing this Trading Partner Workgroup (AKA Trading Partner 6). The challenge was that the entire application worked off a couple of Microsoft Access databases. Our options were either a) port it to SQL or Oracle b) wrap the Access databases with a central server application. We went with b) because we didn't want to force customers to buy an expensive database server on top of our expensive software. My job was rewriting the UI tier to talk to the server which was being developed by one of the senior programmers. Up until then I mostly worked on VB6 code but this project was heavy in Visual C++. I took a ton of programming courses in C++ at college but there was virtually no comparison. Yeah, the language is the same but college didn't teach the Win32 and MFC APIs that you have to darn near memorize to be effective. Knowing VB6 inside and out barely helped because it's like a nuclear bunker shielding you from these often obscure methods. Ever have a really great month? I mean a really great month? December 1999 was one of those for me. It started when I filed for graduation in the upcoming spring semester. When they added up everything in my transcript it turns out I had enough to graduate at the end of the month. I was looking forward to a final, complete blow off, semester but was even happier to skip it. Upon hearing that news I stopped in my boss' office to ask about being hired as a "real" employee. This whole time I was still a junior/student programmer which meant I was paid by the hour. He agreed and offered a salary that was great for someone whose diploma wasn't even printed yet. That evening I bought an engagement ring for my girlfriend of several years. I didn't want to get married until I was done with school and had a stable job, obviously I didn't want to wait long once those were checked-off. I picked the turn of the millennium to propose. Ah, the turn of the millennium. I didn't personally know anyone who thought all the computers were going to crash, or thought Jesus was going to return, or thought the world was going to end, or thought anything remotely interesting was going to happen at all. All the programmers at our office were given the OK to go out and celebrate but "be available in case anything goes wrong". We had little to no Y2K concerns though. We had one legacy product that still ran on Windows 3.11. It was specific to the health care industry and our two biggest clients never upgraded. For all I know they're still running Windows 3.11. I didn't support that product but the guy who did sure didn't receive any panicked phone calls at midnight. I took the "be available" request to mean "be able to get to the office within 24 hours". My soon-to-be-fiance and I hopped in the car and drove down to New Orleans to celebrate the occasion. If a massive computer crash really did cripple the country then at least we'd be somewhere warm. It was a new millennium which apparently meant it was time for TSI Software to adopt a new identity. Let's face it, "TSI Software" wasn't the greatest name. 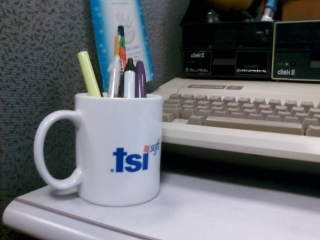 There were many employees who didn't know what "TSI" even stood for (it was "Turnkey Systems Inc" by the way). So the company decided to rename itself after its flagship integration package - Mercator Software. "Mercator Software: The A2A, B2B, B2C eBusiness Integration Company" was the full name announced that harshly cold day in Chicagoland. For anyone unfamiliar with short-lived buzz-acronyms they stand for "application to application", "business to business", and "business to consumer" respectively. That subtitle would be quietly dropped later. Rebranding meant emptying the supply closet of anything with the TSI logo on it. All the TSI coffee mugs stacked in the kitchen also had to go, I grabbed a few and keep one on my office desk to this day. Despite the free office supplies, this lowered the morale of our location quite a bit. In all the press releases and marketing material there was nary a mention of anything our office supported. We always knew the EDI products were the b-team of TSI, like the Macintosh team at Microsoft. Still, we produced a line that was profitable and had several huge accounts. Rumors started that they were going to sell our branch of the company or turn it into a maintenance only shop. In reality they simply saw the EDI line as having little growth potential. Enterprise application integration (EAI) was going to carry the company to new heights. It was a fairly open playing field in 2000. In addition to Mercator there was SeeBeyond, Vitria, webMethods, Tibco, and CrossWorlds fighting for a piece of the pie. Only Vitria and Tibco still exist as independent companies today. Another source of angst was the delay of Trading Partner Workgroup. We were done and ready to ship but had to wait until we received the new logos, splash pages, and icons. "Go ahead and fix a few more bugs or something" were our instructions for coping. The problem was, we didn't have any bugs that we thought could be fixed in the anticipated 1-2 week delay. If only we knew the delay was months instead of weeks. Instead I wrote my first, and to date only, Easter Egg. I decided to have a little fun with the rebranding by hiding a pong clone with the text "Mercator Software: The P2P (paddle to paddle) eBusiness Integration Company" in the title bar. It was a one-player game with some rudimentary computer AI and adjustable speed. Not too shabby for an afternoon's work. It can be accessed in the user administration screen by holding the CTRL key while clicking on a specific component and dragging it to reveal a pong icon. For months our stock rose at a breakneck pace. It was all the buzz of the office, a bigger deal than the new identity even. When we broke $100 it was thrilling, when we broke $120 it was unbelievable, $130.. $140.. until we maxed-out at $149.875. Let's do some quick math here - on March 7, 2000 we had 22.4 million outstanding shares so we were worth $3,357,200,000. We had no idea where it was going to stop, $200 a share didn't seem impossible even if it seemed completely unreasonable. Of course I didn't own any stock at the time. I had a bunch of stock options at $30 but didn't think to cash them out. I was probably waiting for the price to break $150. I wasn't the only one, I can only think of one single programmer on my team who had the foresight to dump all his shares when the stock first surpassed $90. Three days later the NASDAQ would hit its all-time high followed by a two and a half year descent. Despite positive earning reports in the coming months, our stock went into a free fall. It's amazing how closely our stock followed the NASDAQ trends. Unlike the dot-com companies we were actually making money, not enough to warrant the stock price but we weren't a black hole for cash like many of them. Still our price was horribly inflated and we were due for a massive correction. I finally understand the appeal of that "Deal or No Deal" show. It's the exact force that drove the dot-com bubble and burst. Someone hands you a briefcase, an object of minimal value on its own. You pick a few numbers at random and suddenly that suitcase is worth $250,000. Sure you could sell it for a tremendous profit but you're obviously so good at picking that maybe you can get $1,000,000 for it. So you pick a few more numbers and now your suitcase is only worth $120,000. How can that be?! It was worth more than double that a minute ago, if you work that magic you had the first time you just know it'll go back up. So you keep picking away, the value of the suitcase keeps dropping. Maybe it jumps up a little bit once, but it never climbs back to its high. By the time you're done you're happy to take $50 for it. It's $50 you didn't have in your pocket in the morning, but you'll spend the rest of your life knowing you could have had so much more if you just knew when to quit. Finally it was time to ship Trading Partner Workgroup. No fanfare, just watching the shipping department hand a couple small packages to the FedEx driver for the first sites that wanted to give it a whirl. The real moment of excitement was waiting to hear of any zany bugs we missed. Fortunately there were very few. After the plunge in March and April, Mercator stock began to creep upwards until July 17th when a bad earnings report led to a 60% drop. Although still above the 1998 levels, the stock was definitely hurting. My $30 options were officially worthless. We had an August surprise, not the good kind of surprise, the kind that knocks your stock down another 40%. We had to restate some quarterly earnings due to a bookkeeping error. Investors really, really don't like when that happens. It's a sign of either a) corruption b) incompetence c) both. I don't believe anyone at Mercator was corrupt so I have to go with b). In a couple months the CEO, and founder of the company, would be forced out along with many long time leaders. If that wasn't depressing enough, Windows ME was released in September. We installed it on one test machine and were appalled at how bad it was. Up until then every version of Windows was an improvement over the prior. Even seemingly minor things like Windows 98 Second Edition were notable improvements. Windows ME was a step down from 98, and paled in comparison to Windows 2000. We did the bare minimum testing we had to and hoped no customers chose to "upgrade". Despite having a stock price that crossed into single digits, and lacking a CEO, Mercator still spent money like it was 1999. Our office was moved from an average, yet expensive, building to a new majestic one that was even more expensive. Our new home was in the Bannockburn Corporate Center. Parts were still under construction at the time and we were one of the first tenants. The place was amazing - glass hallways with views of a neighboring wooded area, fireplaces, kitchens nicer than the average home's, and of course $500 Aeron chairs for everyone. There was an underground parking garage but we had a limited number of spaces so we rotated the parking pass every week. On top of all that, we dished-out for the breakfast catering service in the building. It was just mind-blowing to think how much we spent on this facility. To be fair, we probably negotiated the contract back when the company was worth billions and didn't move in until our wing was ready. The only complaint anyone had was the new open cubicle environment. We were all accustomed to cubicles with 6ft walls and tons of privacy. The new office sported desks with virtually no separators. Everyone, myself included, hated it. Today is a different story though. I've found that development teams really do work better in a lab or open environment. There are occasional moments of friction but the productivity gains are tremendous. Mercator's CEO search ended when former IBM executive Roy C. King was hired. His resume was impressive enough. Within the first weeks he paid our office a visit and held a little Q&A session for us, seemed like a good enough guy. Shortly after his visit rumors started swirling that our office was going to be closed. I don't know if someone overheard something in the bathroom or what. I (naively perhaps) chalked it up to the general fear of change that accompanies new leadership. I started graduate school at University of Illinois: Chicago this month. Twice a week I'd head down for some evening classes and study over the weekends. It took until spring 2004 to finish because I kept a light schedule, usually just one course a semester plus thesis work. The office closing rumors gained support as we experienced a work slowdown. The support, training, and sales were all buzzing away; but us programmers had nothing to work on. There were no approved projects for us so we wasted a lot of time. Some of us got hooked on Bridge Builder, other times we worked on enhancements that we just plain felt like doing. I wrote some SOAP/XML import capabilities for Trading Partner just to see if it would work. I also setup a profile on monster.com. Not long after the new CEO announcement we also hired David Linthicum as CIO. If you read EAI articles you've certainly come across some of his writings. To the staff it was communicated that Mr. Linthicum would be working out of his home. The idea of someone sitting in their living room, possibly in their pajamas, making a fat stack of cash wasn't especially motivating. I didn't work for him long enough to form an opinion one way or the other. The stock rose a bit earlier in the year but was now on the way back down. One guy in the office used to update a white board with the stock price on it, something that was started back in late 1999 when it was soaring. As a joke, he started taping the current price in cash to the board instead of writing it. It brought some much needed light to a depressing situation. April 19, 2001: Was I Just Fired via Yahoo!? After several months of boredom and speculation it was official.. well, almost. After market close we held our quarterly earnings meeting which was streamed over Yahoo!. At the meeting it was announced that Mercator was laying off 20% of their staff and sub-leasing some expensive property. No specifics were given. It didn't take Sherlock Holmes to figure out what was going on - ~20% of the entire workforce was located in our very pricey building. Oh, and we also announced another vice-president had been hired. The layoff announcement was made on a Thursday, the following Friday was surreal. I'd worked many late nights at the office but none were as eerily silent as it was that entire day. First sign of an impending layoff - you start seeing HR people you never have before. The next Monday most of the staff were assembled into the largest training room and notified that they were being laid-off, myself included. The product lines that our office supported were going to be sold and only a few were being retained for support purposes. Functions like sales and training would be consolidated to one of the surviving locations. It was handled very respectfully. We received modest severance packages based on years of experience. We were told to take as long as needed to pack-up, no security escorting us from the building or any other horror stories like that. Despite the fair treatment I did see one individual gut the motherboards and hard drives from their PCs on the way out. Not being an ideal time to start a confrontation, nobody said a peep to him. However, I don't like his prospects if he ever applies for a job where any of the rest of us now work. I felt relieved not to be one of the few remaining employees. I didn't look forward to unemployment but thought their position less envious. If they quit before the product line was sold it would be a voluntary termination, no severance package. If they stuck around they'd eventually collect an ever better severance package or employment with a new company but could face months of total boredom in the process. Every April 23rd I celebrate "Mercator Day" by bringing my resume up to date. 2001 wasn't the greatest year for technology employment. Although not as bad as the time of this writing, it was still pretty rough. Even so, I was only unemployed for four weeks. Looking back four weeks doesn't seem like much, but at the time it felt like an eternity. The first week was alright, I started off strong. I made a vow to keep a normal schedule, wake up at 6:00 and go directly to "work". I'd scan Monster, Dice, and some other job sites that no longer exist. I went out to the web sites of nearly every local company with an IT department and checked their postings. I set daily quotas for number of resumes and cover letters to send out. After week one I received a few calls but no interviews. Week two was better, I had 4-5 interviews at companies in various industries but no offers. In the third week everything came to a grinding halt. No interviews, no calls, nothing. Needless to say I was starting to get worried that this might be a protracted ordeal. Again, in hindsight three weeks was nothing. I remember the state of mind I was in at the time though and know I couldn't have been convinced of that. The fourth and final week was a rapid turnaround. Two interviews, both resulting in job offers. I went with Job B. The loose environment from Job A scared me off a bit. I just came from that and was concerned they were stuck in 1999 with a crash lurking around the corner. It just felt too much like Mercator. Job B, on the other hand, was at a place I was confident would be sticking around for a while. Being able to continue graduate school was the real deal maker though. The short-term higher salary wouldn't make up for the gains graduate school reaped. I haven't second-guessed the decision once. I learned a few lessons from my brief period of unemployment. 1) Don't count on headhunters to find you a job. 90% of the phone calls and emails I received were from 3rd party IT recruiters. Not one single interview resulted from any of them, not one. I have no idea how they make a living. Twice within the last year I've received calls from headhunters I last talked to in 2001 wondering if I was still looking. 2) Keep your resume up to date even if you're not looking for a job. I guess I figured I could crank out a decent resume in an hour. Not really. The first version I went with was extremely rough compared to what I was using after four weeks. It evolved as I received feedback. I now make it an annual tradition to update it, probably should do it more often than that. 3) Keep multiple versions of your resume handy. For example, I've done C# and Java programming. If I ever had to apply for a C# programming job I'd send the version that accents the C# projects with Java as more of a side note. The "keep your resume under one page rule" is a decent one. Maintaining multiple versions helps accomplish that. 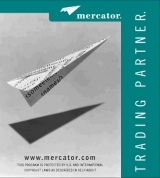 In 2002 a company called emanio acquired the Trading Partner and OnCall EDI lines from Mercator Software. Some of the remaining staff in Bannockburn were offered positions with emanio that allowed them to work remotely. emanio continues to support and update Trading Partner, no word on whether they removed the Easter Egg. On August 4 2003 Ascential Software acquired Mercator Software for $106 million in cash, 3.16% of what it was worth on March 7 2000. On March 15 2005 IBM acquired Ascential Software for 1.1 billion. Roy C. King would go on to hold CEO positions at Security Source and Gevity Hr before taking his current CEO position at Integrated Wealth Services, LLC. I suppose some would hold a grudge against a wealthy CEO who laid them off. Not me. Mercator, like hundreds of similar companies at the time, was spiraling out of control when he came in. He was in a position that required some unpopular actions if there was to be any chance of turning the company around. I'm sure he didn't want his first CEO gig to start with layoffs, or maybe he did, either way it's pointless to feel anything but ambivalence towards him. The VP who I gave the disastrous demo to in 1998 now owns a Goddard School franchise. Orignally posted as a separate article, please forgive any duplicate comments. From 1998 to 2001 I was a programmer for the now defunct Mercator Software. Well, it wasn't always called "Mercator Software" it used to be called "TSI Software". Shortly after going public they decided to go with a new image. The powers-that-be renamed the company "Mercator Software" after our flagship integration product. An expensive marketing/branding consulting company was hired to come up with a new logo. Our team had a product ready to launch but had to sit idly by waiting for the new logos & icons to arrive. During this downtime I added my first, and to date only, Easter Egg to a program. I think that's a significant improvement. Can I collect my massive consulting fee now?